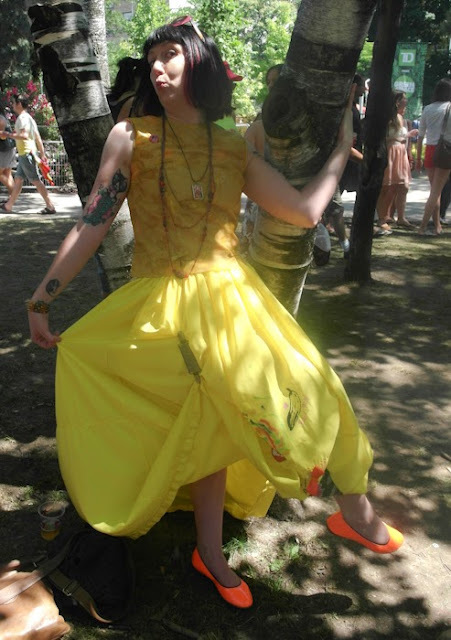 The Fashionable Bureaucrat: Traveling Yellow Skirt Freak Show: Toronto Pride Edition! 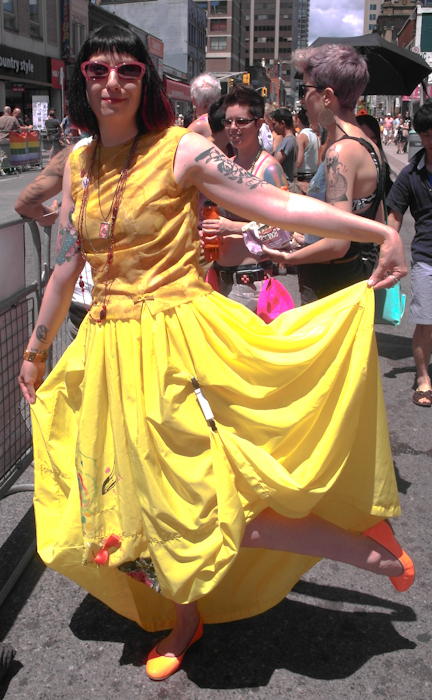 Traveling Yellow Skirt Freak Show: Toronto Pride Edition! 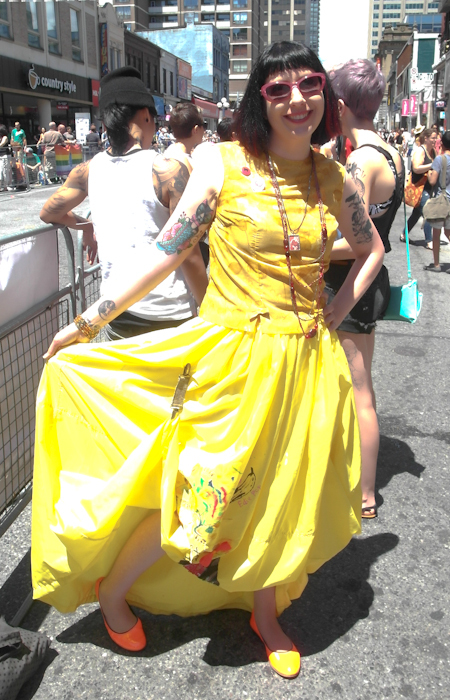 I had the honour of hosting the Traveling Yellow Skirt this past weekend and I wore it to Toronto Pride on Sunday. It visited the parade, Cawthra Park, and Woody's. WHOOOO!! 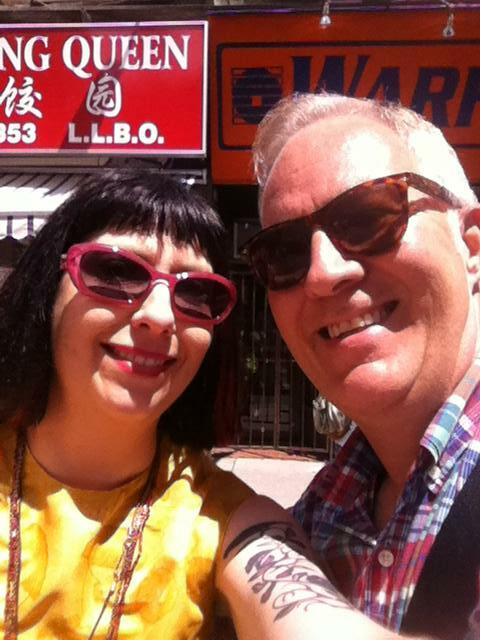 First, let me introduce my pride guide (or sherpa), Jamie! He's my coworker and a awesome person with whom to spend the day. The sign behind us was just a happy accident! Standing along the parade route. What do you think of the neon orange shoes? Or Traffic Cone orange! I wore them all weekend and my feet were comfortable as heck. We didn't last very long at the parade though since it was hella hot! I only got a few shots. 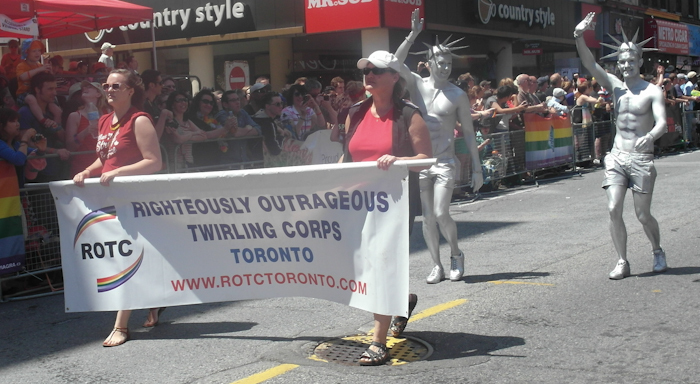 I really loved these outrageous twirlers and the silver painted guys (statues of liberty?). I loved this dress and the shoes are very "Vivienne Westwood-esque". And the rubber ducky purse! GHA! That would be perfect with the yellow skirt! Being too hot, we retired to the Disco party in the park where I tried to find fabulous people with which to have my picture taken. Unfortunately there were a lot of jorts and t-shirts! So I chose to pose with this birch tree. And with my beer. This skirt is super duper hard to photograph in the sunlight. It just glows insanely. In the above photo you see one of the clips I used to hold the skirt up since it's quite long and I kept stepping on it. Finally I found this gorgeous woman who agreed to have her photo taken with me. WHOOOOO! Then we went to Woody's where I spent the night among a lot of gorgeous men who had no interest in women. I had an amazing amount of fun. Thank you Jamie for helping me make this post possible! HA HA! LOVE the skirt billowing at Pride. 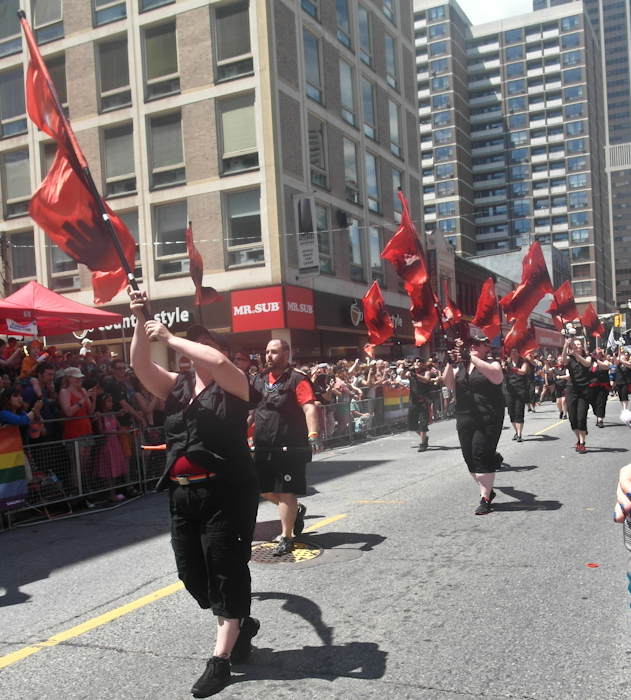 She also watched the Pride parade in Vancouver before embarking on her trip. Is this a trend?! Your clips are perfect for this long neon puff. Your top and neon shoes are excellent. 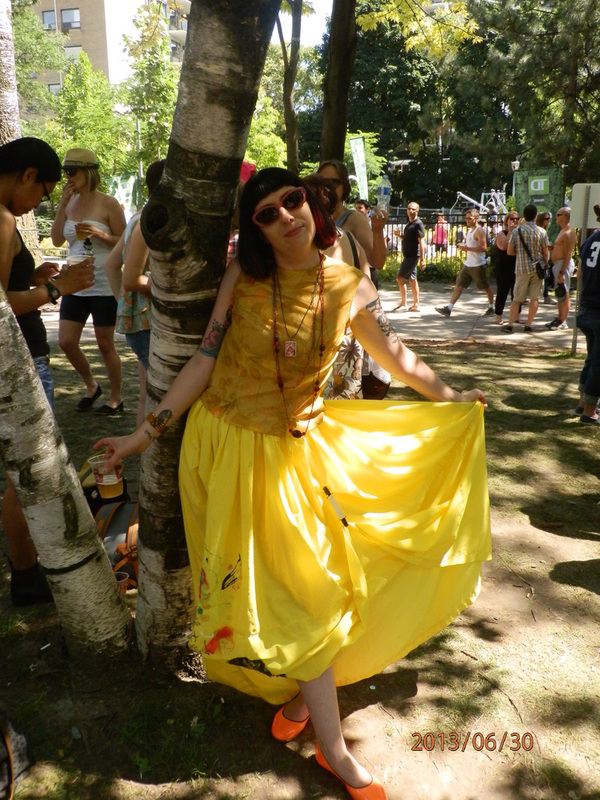 Thanks, Megan, for wearing this skirt so magnificently and adding to her glorious journey. I'll do a post on this soon. Ha! I love these shots - you look like you're having so much fun camping it up in head to toe sunshine! 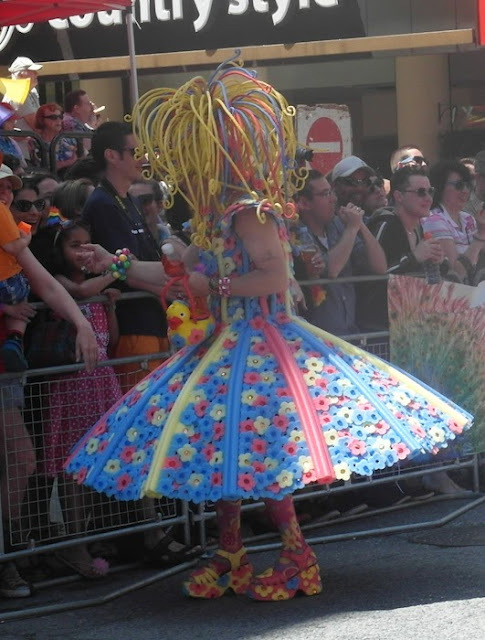 It was a great idea wearing it to Pride, where it was surrounded by rainbows. Great styling with the clips and I think your addition will look wonderful. Nice job! 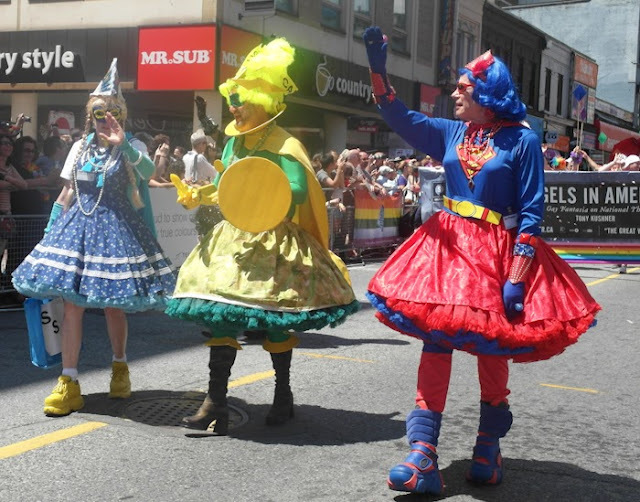 OMG - if you thought it was hot, I hate to think how the people in the parade felt wearing their costumes! WOOOOOOOOOOOO!!!!!!!!!!!!!!!!!!!!! Terrific Yellow Skirt adventure, Megan!!! LOVE it! And I love the traveling skirt! Crazy bright! 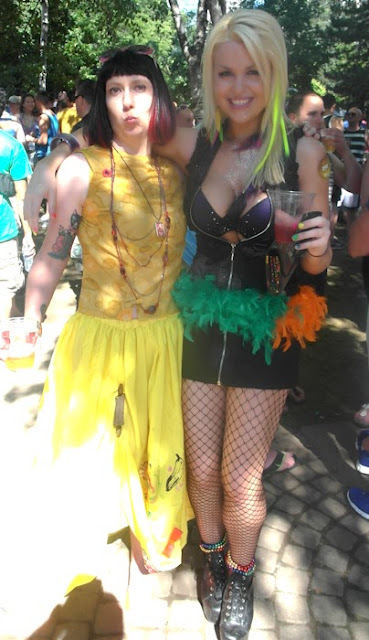 I've been to Pride in TO once and ended up sick from heat stroke. More power to ya. It's not a time to wear subtle outfits, eh? Oh, what a perfect way to celebrate the Yellow Skirt. Love it!